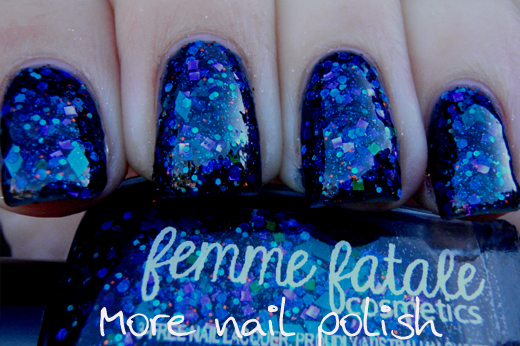 I have two polishes from Aussie indie brand Femme Fatale to share today. Glistening Lodestone is full of all sorts of glitters so I'm just going to grab their website description as it's much quicker than me trying to pick out everything I see. 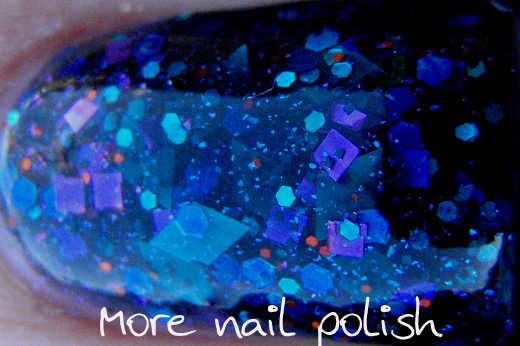 Glistening Lodestone contains teal diamonds, holographic blue glitter in various sizes, green and purple squares, small orange glitter and blue flecks all in a dark navy blue jelly base. 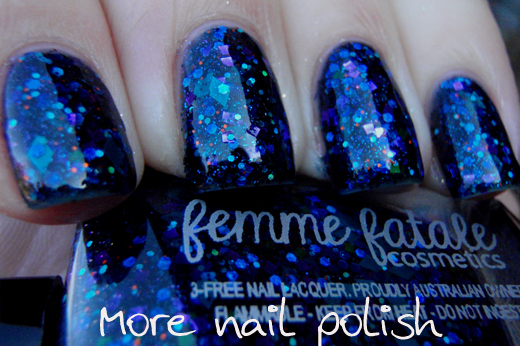 I used three coats here, mainly because I wore it on it's own and I needed to build up the dark navy jelly base. If you layered over black or navy you would only need one coat. 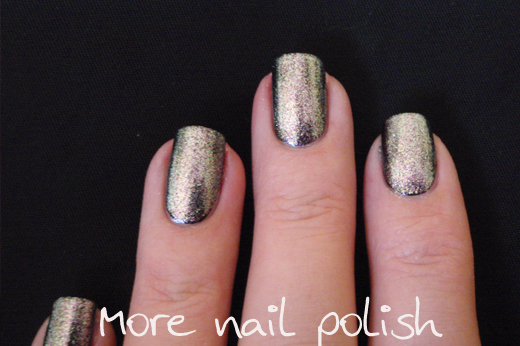 I used two coats of top coat, Glitter Tamer and Seche Vite - and the result was glassy smooth. Absolutely beautiful polish, but sadly this is the polish I was wearing when I busted my nail, so I have sad (and ouchie) memories of wearing it. Here is Shimmering Snowcap, which I wore exactly one week after busting my nail last week, so these are my one week grown out nubbins. Shimmering Snowcap is just beautiful. I reminds me of Lynnderella Love, Lace and Lilacs with the addition of the copper coloured iridescent squares. At some angles the iridescent squares look transparent light blue, but when the light hits them you get to see the copper glow. This is one dabbled coat over OPI Don't Pretzel my Buttons. This only has one layer of Seche Vite top coat applied, but I did add a layer of Ulta3 Non-chip after taking these photos and seeing it a little bumpy. 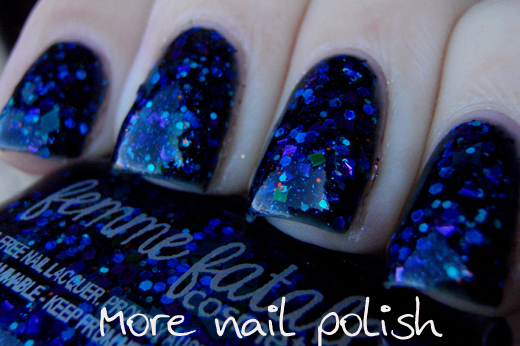 Femme Fatale polishes are available from the Femme Fatale Cosmetics site, although they are only available for delivery to Australia. 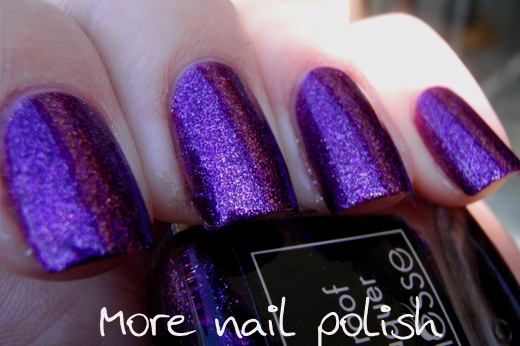 Yesterday I said that I did end up layering something over Picture Polish Wisteria, well here it is. 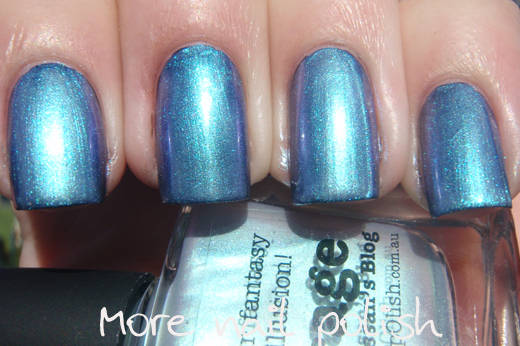 I layered one coat of Picture Polish Mirage. 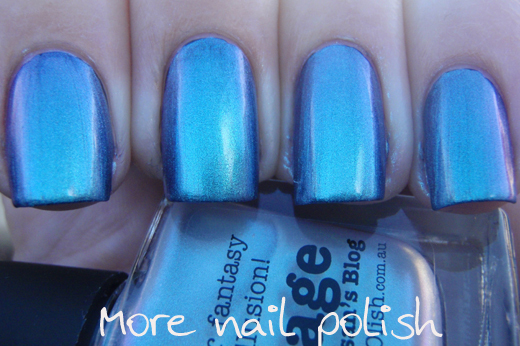 Mirage is the other polish from the collaboration collection (together with Kryptonite) that was created by a nail blogger, Sara Hassan in Pakistan. 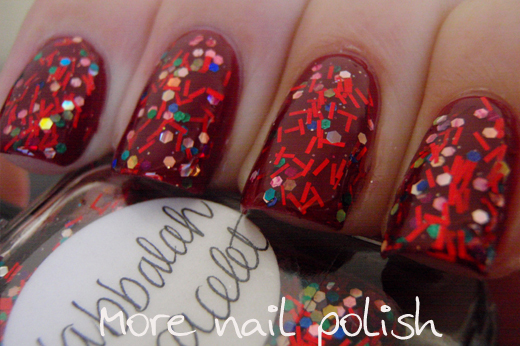 To be perfectly honest, I wasn't completely blown away with this polish when I first saw it in other swatch photos. 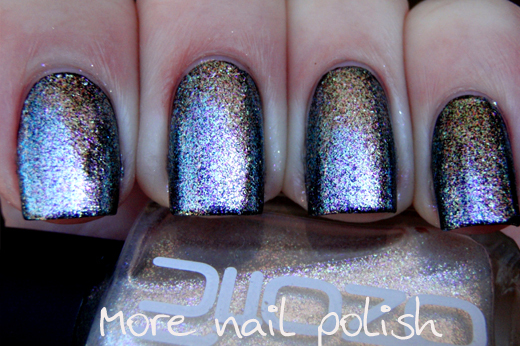 I thought the duo chrome finish, whilst a pretty colour, looked rather frosty and a little patchy. However, now that I have tried this polish and particularly because I layered it over wisteria, I think it is absolutely gorgeous. 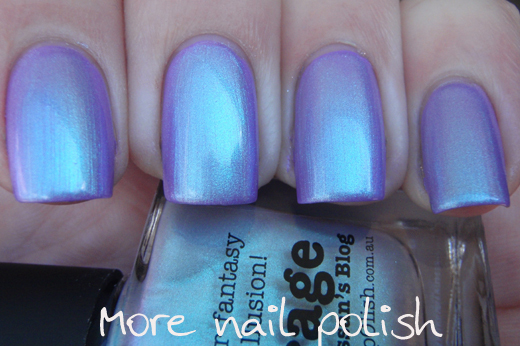 The lilac base of wisteria really brings out the purple duochrome colour shift in mirage. Indoors and in the shade this looks spectacularly stunning, although in the sun you can definitely see the brush strokes and it is still a bit frosty. I also layered mirage over back and I actually found that a black base was a little less forgiving. 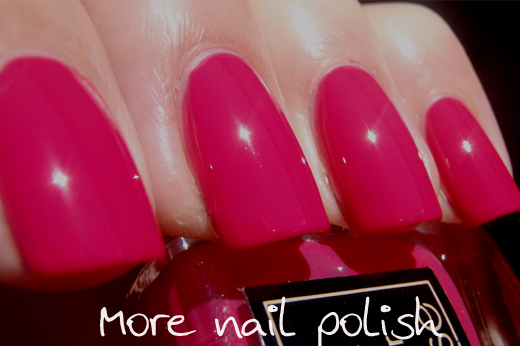 I had to be careful not to wipe to many times or I would get bald area at the back of the nail near the cuticle. 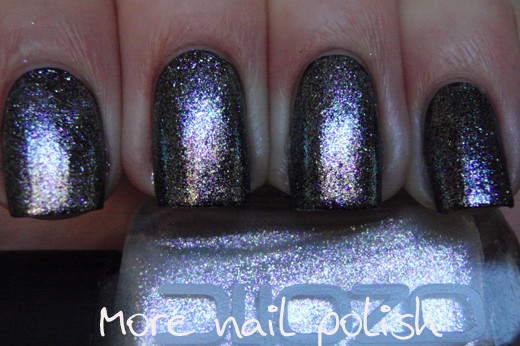 You can see the slight duochrome layered over black, but nothing like it layered over wisteria. I'm planning on taking part in a Halloween themed nail art challenge, so it looks like you will get to see my shortly nubbins before I planned on it, cause the first post is scheduled for October 1. Have a great weekend everyone - and for those of us having a long weekend this week enjoy that extra special day. Did you know that (according to Wikipedia) the ACT and Tasmania have the most public holidays per year with 12! Then NSW, Vic, SA and NT with 11, then Qld and WA with 10! 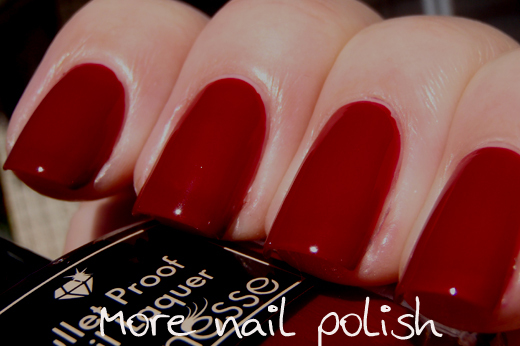 Sometimes there is nothing nicer than a plain simple clean creme polish. 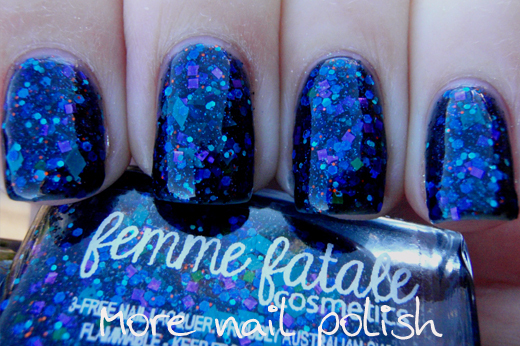 I had heard a few people rave about this shade, so I just had to get it and I am so glad I did. I don't wear plain creme polishes on their own very often. 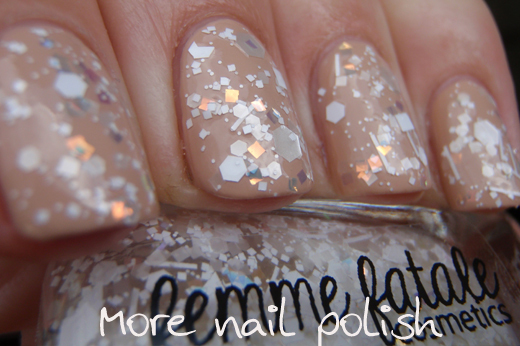 I'm always layering shimmers, or topcoats, or glitters over them. So it was a lovely change just to wear it alone like this. 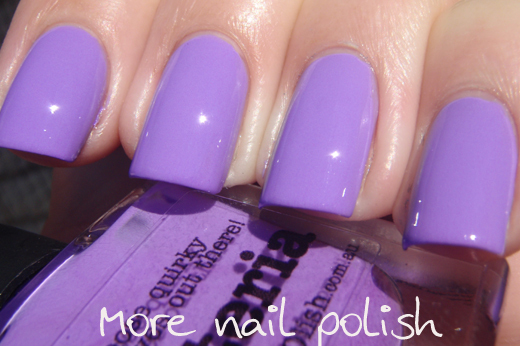 Picture Polish Wisteria is a cool toned lavender creme polish. 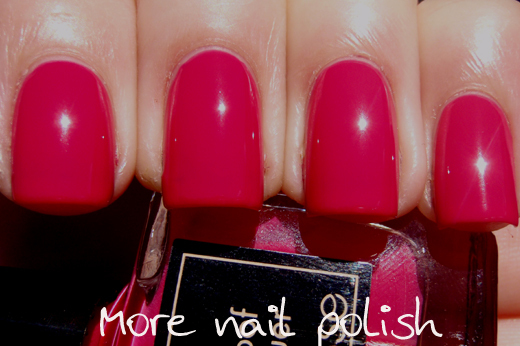 It applies beautifully in two coats and it is just the most perfect shade for spring. 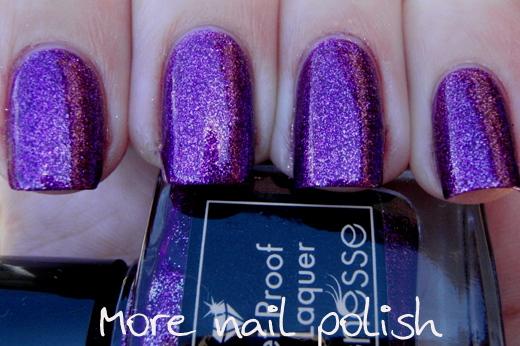 Our wisteria bush out the back is just starting to bloom and this polish is a striking match. In fact I really should have featured some photos with the wisteria flowers. Of course I did layer something else over this polish the next day, but I will show you that tomorrow cause I'm stretching out my posts while my broken nail grows out a bit. People, I broke a nail. Ermahgerd right! Thankfully I don't break nails very often, but on the weekend I was loading a very large box containing a plastic cubby house into the back seats of the car. The box slipped from my fingers and pulled back and broke off a nail right at the nail bed line. I filed all my nails down to try and make them even so I am sporting my nubbiest nubs that ever nubbined! Plus my corners got all rounded off so now I have to work on my shaping as they grow out. DOH! I still have exactly five sets of photos of my nails from mani's I wore or swatched last week, so I will just see how quickly my nails grow in five days, cause then I will have to photograph my nubbins. In the mean time you will only be getting one one NOTD a day. 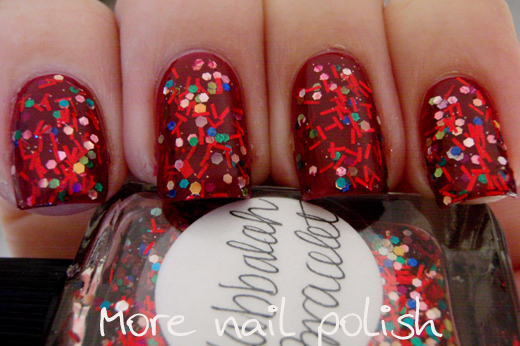 Here is one such polish I wore last week. 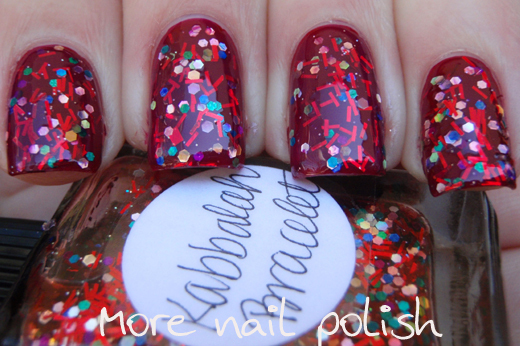 This is one coat of Lynnderella Kabbalah Bracelet layered over Mirenesse Berry Boa. I loved this combination. 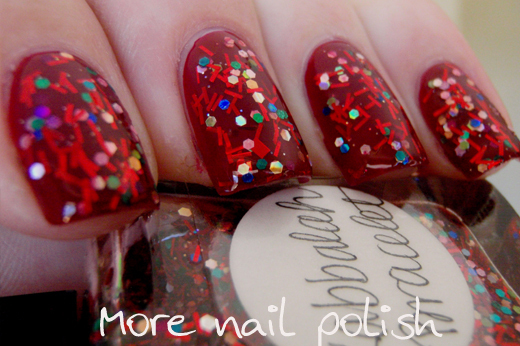 Berry Boa is so rich and dark so the red string glitter showed up nicely. 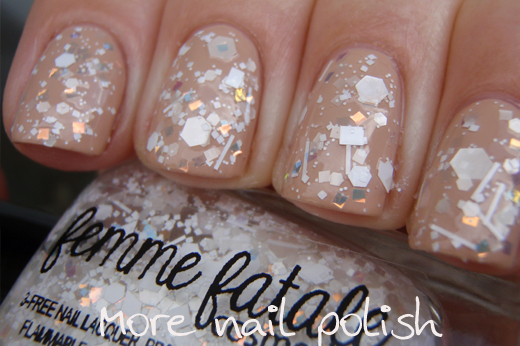 I have a secret crush of bar glitter, I must be one of the few people that actually like it. Now let us all have a moment of silence in memory of all our nail tips that have been lost or broken during our short moments of clumsy stupidity. 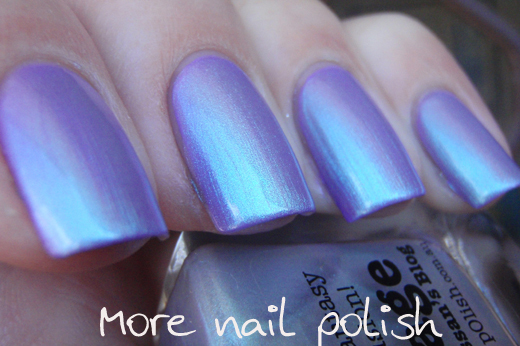 Today I have three lacquers from high end Australian brand Mirenesse. I have recently tried some of their makeup products that were in my monthly 'Lust have it' sample bag. I've tried their Icon concealer and their Velvet Lip Lift lip glosses, and I've liked both of them. 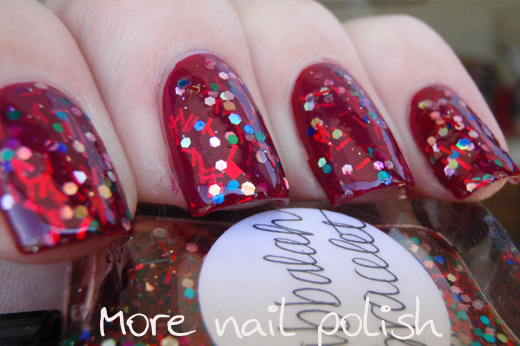 I was therefore quite excited to receive an email asking if I would like to try their recently launched line of nail polishes called 'Bullet Proof Nail Lacquer' which consists of 11 polishes. 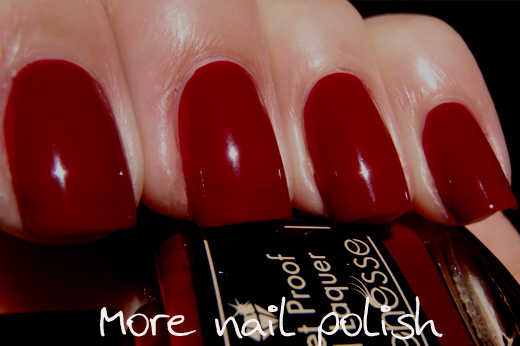 Berry Boa is a deep maroon red creme. The formula was just fantastic, this is one coat. I didn't put a top coat as I wanted to see how the finish was, especially as they say that they dry to a "high shine, mirror like glossy finish". I'm pleased to report that they do indeed dry nice and glossy, and it also dried pretty fast as it was only one coat. 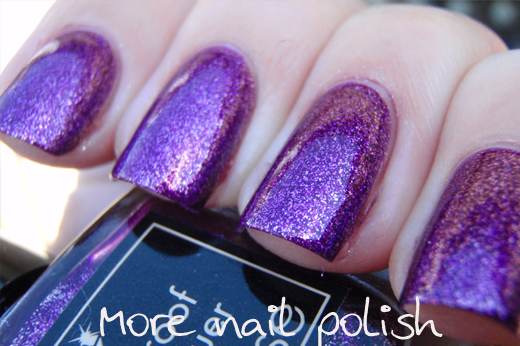 Charleston Me is a rich purple with micro silver glitter. 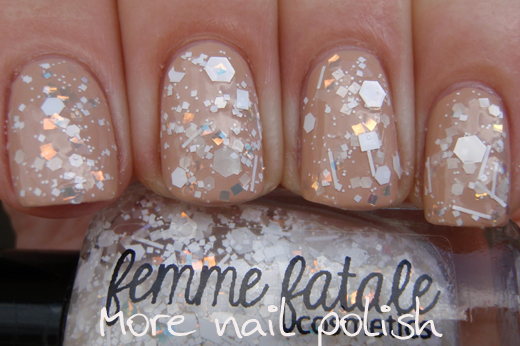 The glitter is so fine that it might actually be a shimmer, but either way it dries totally smooth and glossy. This was pretty much a one coater too, but I couldn't help myself putting a second coat of this on. Flapper Pash is a bright pink glossy creme, but the sunshine on my nails below makes this look a little brighter than it is in real life. 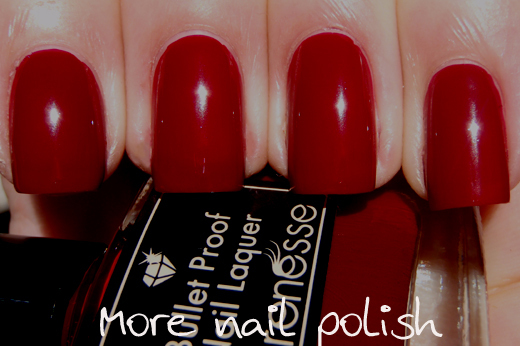 Again the formula on this was just fantastic, one coat and super pigmented It dried to a gorgeous smooth and glossy without the need for topcoat..
Mirenesee polishes are three free and contain no camphor. They are also not tested on animals. The bottles are lovely little flat square bottles, a similar shape to Picture Polish bottles and I had no issues with the brushes. I just wish the bottles held a little more than the 8ml they do hold. These are absolutely beautiful lacquers, but they are certainly in the luxury price range competing with the likes of Chanel - which retails here in Australia for $39 a bottle. 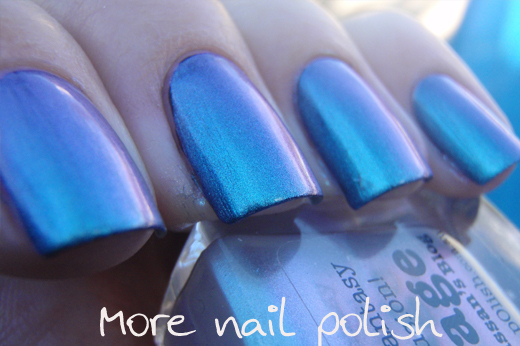 Mirenesse bullet proof lacquers are available from www.mirenesse.com and have a RRP of $29.95. 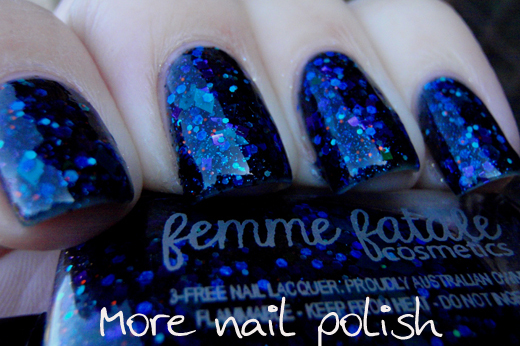 These polishes were sent to me for review, see my disclosure policy for more information. Yay - I did it. Eight blog posts in one night. 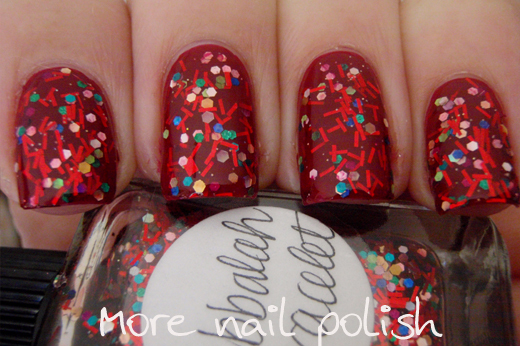 109 swatch photos uploaded to those eight posts from - wait for it - 463 photos I took of my nails wearing the new Ozotic Sugar and Beam polishes. No wonder my brain feels fried. 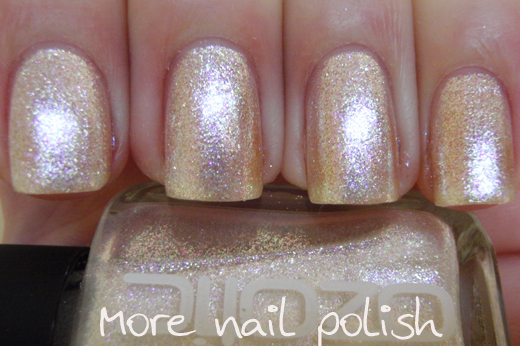 To finish things off, here is Ozotic 908 Beam. 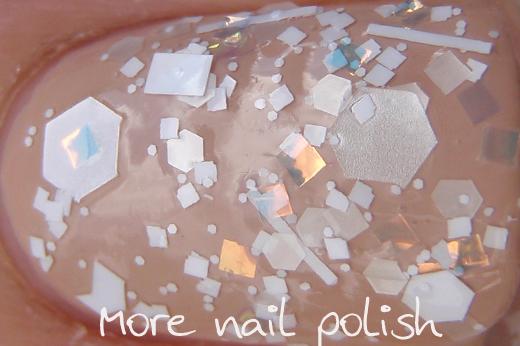 This last shade in the collection has blend of pink and yellow micro glass flecks. The pink flecks shift to purple and gold and the yellow flecks shift green. Therefore you will see combinations of pink and yellow and purple and green. This is one carefully applied coat of 908 over black. 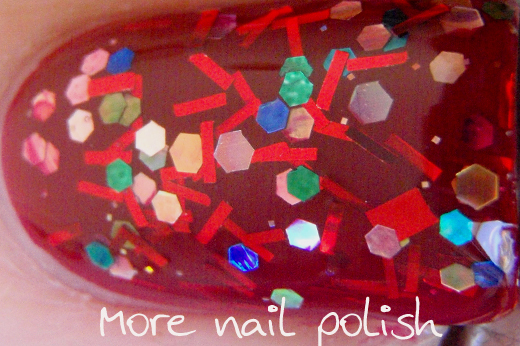 You know the deal now, if you want just one coat, don't use too much polish on the brush and don't wipe over your nail in the same spot too many times, otherwise it may pull some of the flakes off and leave it with streaks. If you are planning on more than one coat, then there is no need for careful application, just slap it on, thin or thick and it will smooth out perfectly after two coats. Here is two coats over black. 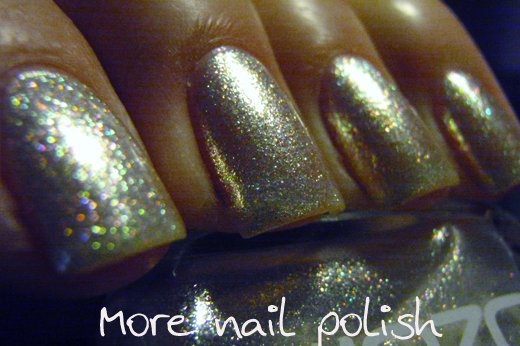 At two coats the overall feel is actually an antique platinum, so it's not silver and it's not gold. 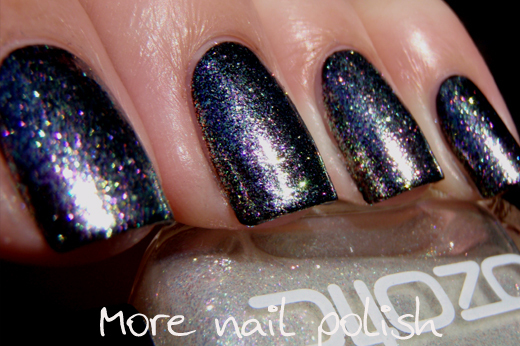 I actually really love this one as two coats over black, it was a really flattering colour for me, kind of like a neutral coloured foil. On its own it has a warm silvery feel, again probably a platinum colour cause it's not gold and it's not silver. This is three coats on it's own. 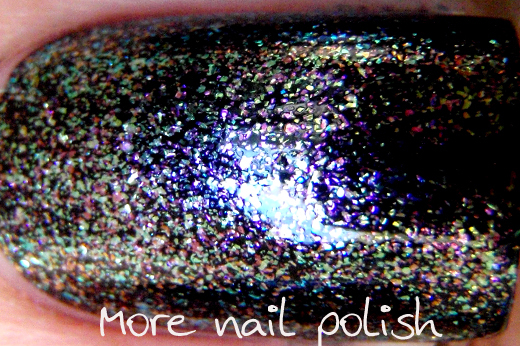 This last photo taken under artificial light almost makes it look holographic, because each of the flakies is reflecting its own colour - just like a holo polish does. Now that I have finished writing up about each of these shades, I think I have worked out the colour combinations of the glass flecks. Bear in mind this is just my interpretation of the shades and what I see on my nails, not an actual official description. Hopefully that list will help you decided which colours you like. My personal favourites are the ones based on the yellow flecks, but then again I really love the blue to purple combos too, and the multicoloured one is pretty amazing. So there you go. 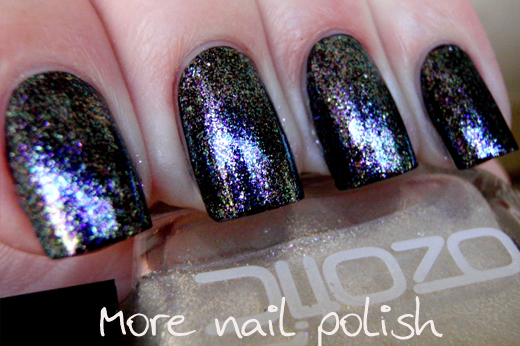 That's the new Ozotic 900 Sugar and Beam polishes. Which ones are your favourites?